Join Us in the Fight to Cure Breast Cancer: Shop Pink! October is Breast Cancer Awareness Month, and Beauty of a Site is inviting you to join the fight by making one simple decision: shop pink! Some of our favorite brands have made their best selling products (that you already love!) available in pink versions to raise money for major breast cancer research and support organizations. The more we buy, the more money is raised for the cause! 1. Essie Pinking About You: Essie has made a charitable contribution to Living Beyond Breast Cancer. Because if we stick together we can do anything. 2. Pedi-Sox Pink for Breast Cancer: are the perfect pedicure solution! Pedi-Sox are simply toe-less pedicure socks, designed to slip on right before your toenail polish, so that your feet can stay warm, clean & protected while your priceless pedicure dries! 3. Tigi Bed Head Masterpiece “Pink” Shine Hairspray: One of our favorite “keep-it-right-there” hairsprays, Bed Head Masterpiece helps you capture your creativity and keep it where it needs to be, all day long. Bright pink and in support of the City of Hope, Masterpiece is perfect for October and any time. 4. Hempz Pink for Breast Cancer: Fresh Herbal Body Moisturizer is enriched with 100% Pure Natural Hemp Seed Oil and infused with our signature blend of soothing Aloe. They come in 6 different scents! Essie No Chips Ahead Top Coat is formulated with a UV color shield and a wear extender to help avoid chipping and peeling. NiMi 10 Day No Chip System on Fox News!! More Great Press for Nicola Milan’s 10 Day No Chip Nail System! Check it out! Huge & Revolutionary New 10 Day NO Chip Nail System! Nicola Milan, otherwise called NiMi for short, has made a brand new product that can give you that PERFECT 10 Day NO CHIP Manicure…..all from the comforts of your own home, and for less than the cost of a salon mani!! This is the first ever 10 Day No Chip Top Coat that does not require a UV light and this is all natural so it will not harm your nails! This system will only take you a short 20 minutes to complete your entire manicure, start to finish!! Talk about saving time! And the best thing is it will last up to 10 days, with no chips or smudges. Here is how to get that perfect Manicure! To ensure a long lasting manicure and/or pedicure treatment. With its dehydrating properties, Nimi Prepare quickly removes any excess oil and unwanted moisture allowing a secure surface to apply. This is a strong adhesive formula that is essential to achieving the 10 day manicure and/or pedicure. This secure bonding creation helps seal the color on and provides a layer of protection against staining to minimize a superior finish. NiMi specialized base coat is designed to grip to any nail lacquer of your choice and promotes healthy and sustainable growth to the natural nail. Let us say that again…..USE ANY of your favorite polishes….any brand!! Apply any color polish to your liking. Be sure to apply first coat and wait 3-5 minutes, quickly followed by a second coat. Allow that to dry for 3-5 minutes also, before applying the last step top coat. This will lock in your color. This Ultra fast drying top coat delivers the ultimate high shine finish making your nails look sensational. With its long lasting wear ability, this is the most durable top coat that eliminates the need for harsh gel polishes and keeps your nails strong and healthy for ten days . Our No Chip Top Coat formula easily needs to air dry and in just minutes you are going to love it! This is also easily removable with any quality nail polish remover!! So there you have it….easy, affordable and completely REVOLUTIONARY!! We know this is going to be such a great product! Be sure to get your now! The Essie Naughty Nautical Collection Sets Sail for Backyard Barbecues! With their Summer 2013 collection Essie managed to steal our hearts with their fun shades and the pretty shimmers. I think it’s mostly the shimmer that got me, who can’t resist that? 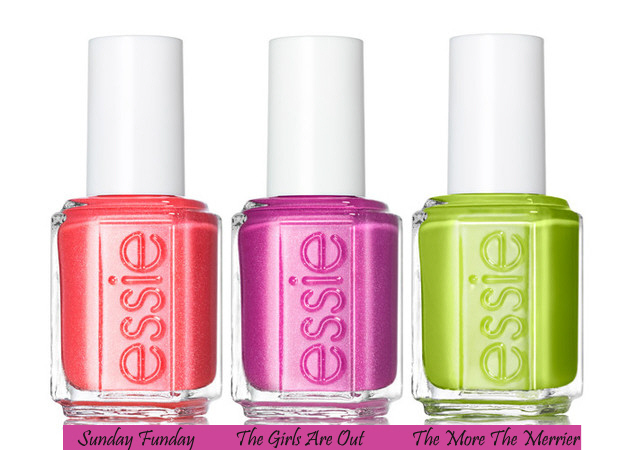 The Essie Summer 2013 consists out of 6 shades and they all contain that pretty little shimmer in them. these new Essie treasures for only $8 make it hard to resist! Only $8 a bottle. Click Here to Shop!